A 'Custodian' is a person who has responsibility or control over electronic stored information ("ESI") data. For example, if John Smith owns and controls a laptop computer, Mr. Smith would be custodian of any ESI found on the computer. We allow tracking of Custodians in Lexbe eDiscovery Suite Platform using "Case Participants", who are the litigants, deponents, witnesses, and other individuals and organizations in the case that provide factual information. Case Participants are often Custodians of ESI in a case, and Custodians are usually Case Participants as well. >Checking ESI collected per Custodian/Case Participant is a quality control check of collection procedures. >Inclusion of particular Custodians/Case Participants in a discovery plan may be dynamic and change, particularly in the early part of litigation. >Deduplication of duplicate email and other ESI often is done per Custodian/Case Participant. >Custodian/Case Participant attribution may be required as part of files delivered in a production. >Admitting the ESI as evidence at trial may depend on being able to track the evidence back to the Custodian/Case Participant in possession. You can assign Custodian/Case Participants to documents in Lexbe at the time of the upload, or later through Multi-Doc Edit or in the Document Viewer. >Upload documents into your case in batches, one Custodian at a time. >On the Upload page, assign each incoming batch of files to the appropriate custodian. Once you do this all files in the batch will be associated the appropriate Case Participant. This feature allows you to assign Custodians/Case Participants to multiple documents simultaneously from the Browse or Search pages. 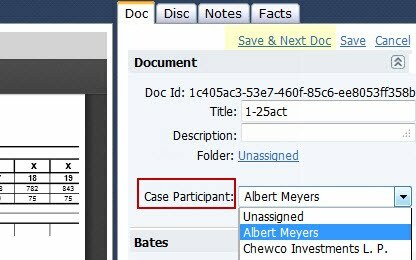 You can also make mass assignments of Case Participants and assign them to multiple files by generating custom Excel spreadsheets uploaded into a case in Lexbe eDiscovery Suite Platform. 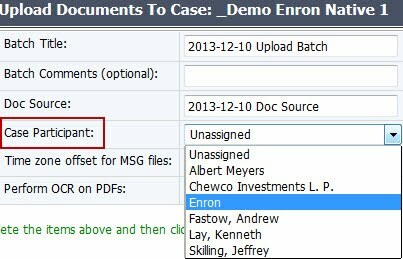 You can also change Custodian/Case Participant assignments on an individual document level from the Document Viewer. Click on any link to a document title in Lexbe eDiscovery Suite Platform, such as from the 'Search', 'Browse' or 'Facts & Issues' pages and assign existing Case Participants to selected documents (one at a time). 1. Filter. You can filter your results down to a specific set of document type by applying filters by 'Case Participants' from the Search and Browse pages. The Case Participants section will automatically display all records that you added from the Analysis>Case Participants page. 2. Sort. Either from the Search and Browse pages click on "Columns" and select the 'Case Participants' field, and then sort data by clicking on the header title. Clicking once will display and forward sort and clicking again will produce a reverse sort. Please note that Lexbe eDiscovery Suite Platform does not index the Doc Id or other fielded data to make search query faster. Deduplication within each custodian is called 'vertical deduplication' and between custodians is called 'horizontal deduplication'. Generally, horizontal deduplication is not considered a best practice as it loses the association of other custodians to the deduped files. 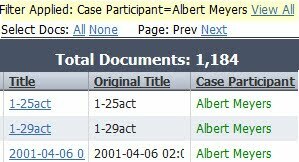 If needed, however, it can be done in Lexbe eDiscovery Suite Platform if Case Participant assignments have not been made. It is possible to identify duplicate files within a Case Participants/Custodian level, such as emails, since individual custodians of data may have duplicate copies of files or documents. Duplicates arise because Deduplication in Lexbe eDiscovery Suite Platform refers to two processes: Outlook email deduplication and Native File (or loose file) deduplication.